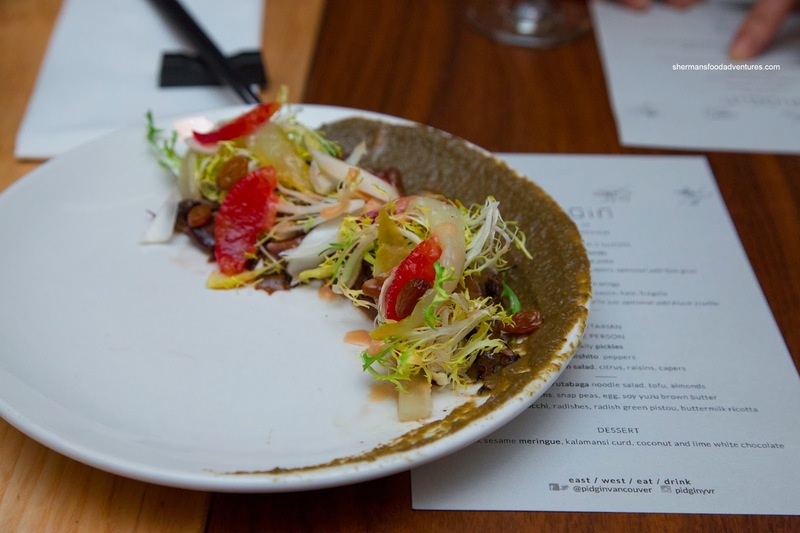 Say what you want about Dine Out Vancouver (including my own thoughts), but it remains a popular event which allows diners to experience an array of restaurants on a budget. 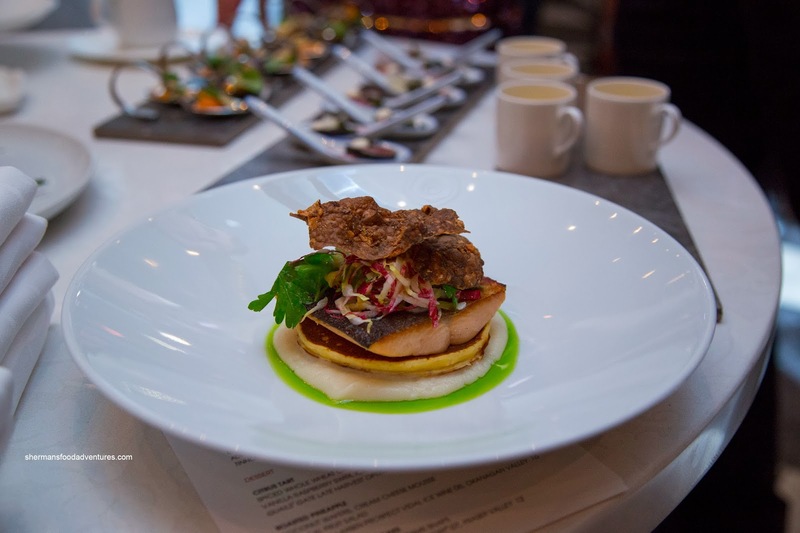 For 2014, the lineup has grown to a record setting 263 restaurants in the Greater Vancouver Area. From January 17th to February 2nd, there will be prix fixe menus of $18.00, $28.00 and $38.00 offered from some of the hottest spots in town. I was invited to experience the media preview where we got to choose a themed group of 3 restaurants. I went for "posh nosh" which included Pidgin, Oru and West. Our first stop was Pidgin, which ironically was on my "to eat" list for some time. We were served all the dishes (to share) that are featured on their dine out menu. Starting with the Bitter Green Salad with citrus, raisins and capers; we knew there would be some interesting flavours to follow. As advertised, there were the bitter elements in the frisee and capers (salty too), as well as the grapefruit (which added a tempered sweetness). The well-placed raisins were plump with a contrasting sweetness. 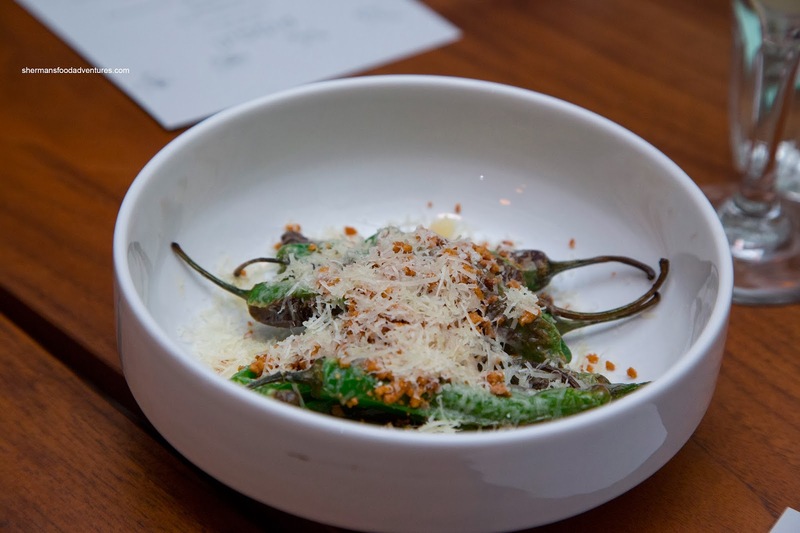 Next, we had the Shishito Peppers with Parmesan and pine nuts. This simple dish featured slightly sweet roasted peppers dressed with the aforementioned ingredients. I would've preferred a touch more saltiness, but a nice snack nonetheless. 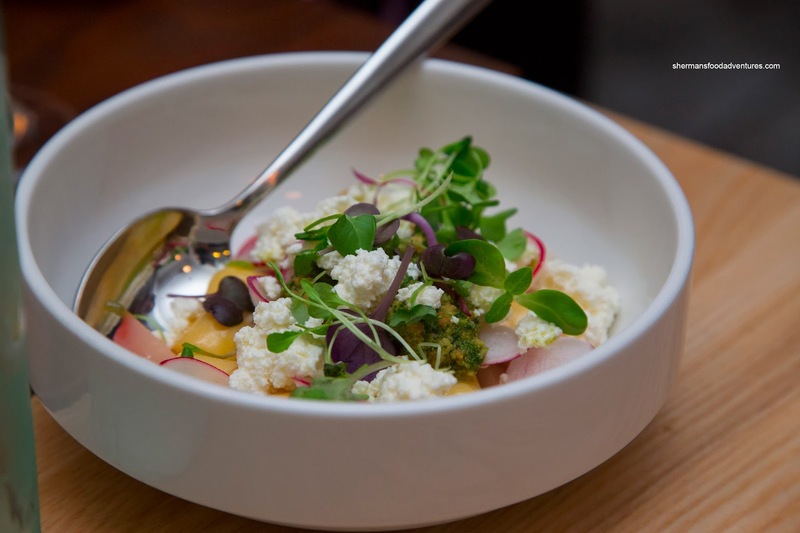 Moving along, we were served the Parisienne Gnocchi with radishes, radish green pistou and buttermilk ricotta. Although the gnocchi were pillowy soft and light, they managed to retain their integrity. The pistou ate like a pesto (of course without the pine nuts), where it was more in the background. The ricotta was not merely a bystander as it added creaminess. 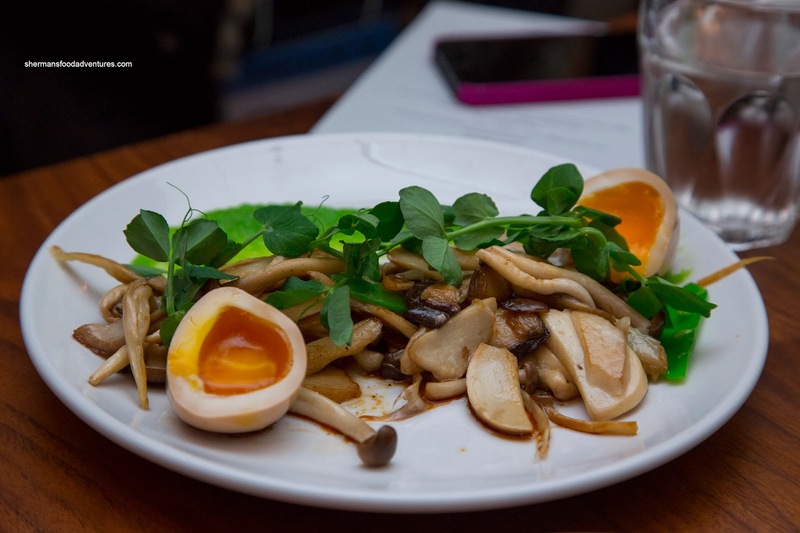 My favourite dish of the bunch was the Mushrooms with snap peas, runny yolk egg and soy yuzu brown butter. The buttery mushrooms in texture and flavour caressed itself all the way down to my stomach. They were expertly prepared while dressed in a rich balanced sauce. 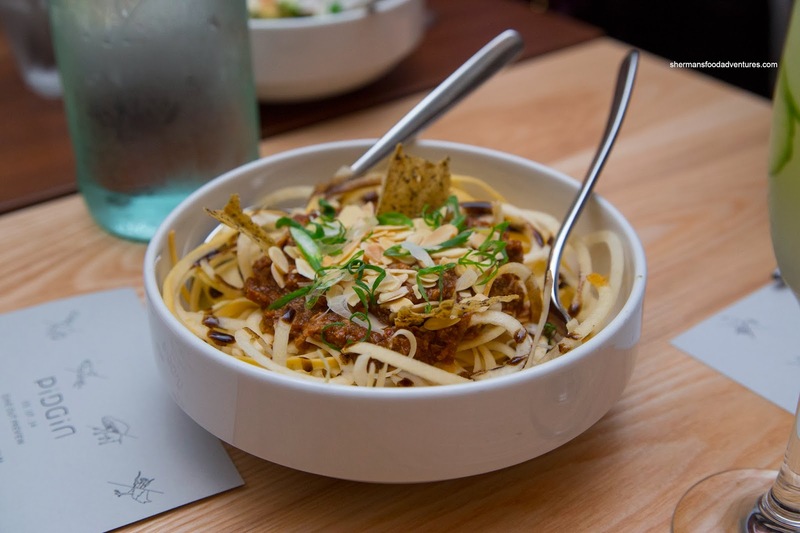 Continuing with the gluttony, we had the "Dan Dan" Rutabaga Noodle Salad with tofu and almonds. At first, I was skeptical of this dish, but it was not bad. The crunchy rutabaga was dressed in just enough sauce for impact. There was definitely savoury and elements, yet lacking in spice. By virtue of being a vegetarian offering, the "meatiness" was provided by the tofu. 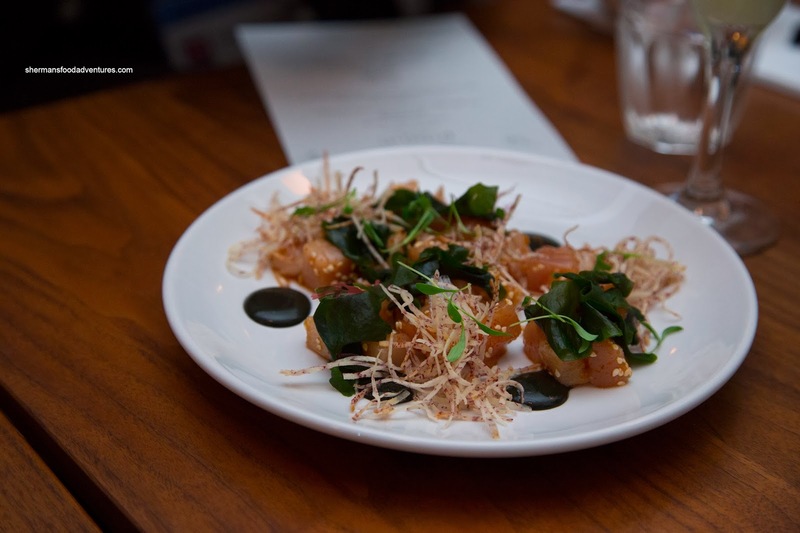 Another tasty dish was the Albacore Tuna Poke with fried taro, wakame and toasted nori squid ink. I liked the soft, yet not mushy texture of the tuna where it was seasoned with a nice combination of sesame oil, soy and the slightest of spice. 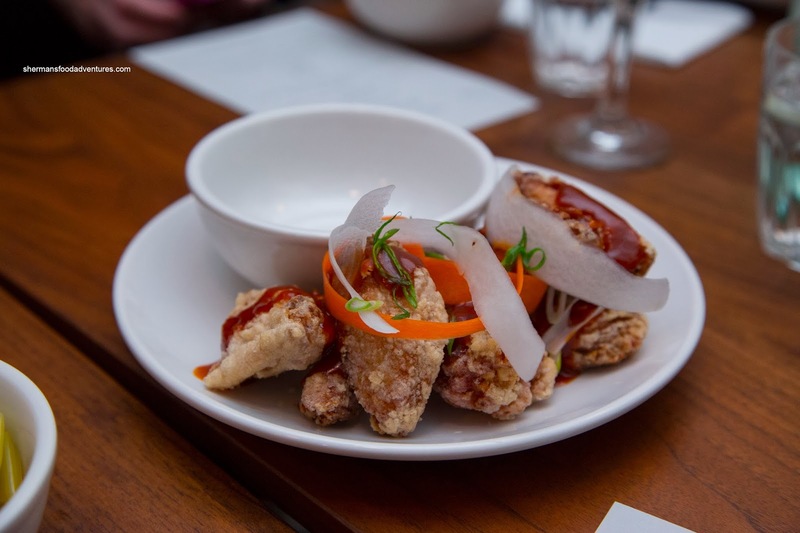 Then we were served the (boasted as best in town - tongue and cheek that is) Fried Chicken Wings with a Korean Gochujang sauce. I thought the wings themselves were prepared nicely being really juicy with a super light crispy batter. They were decently seasoned on their own, but with the addition of the red pepper sauce, there was a sweet spiciness. Can't comment on being best-in-town because the wings are very different than Phnom Penh. 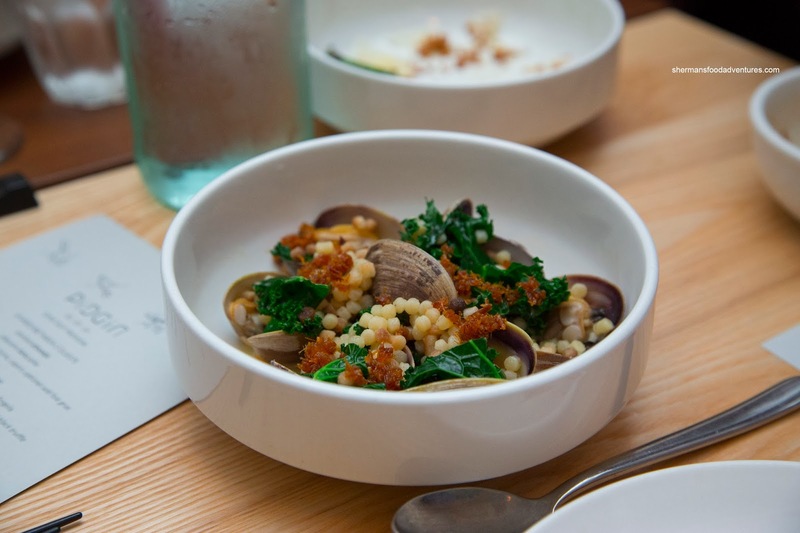 The Sake Steamed Clams (with XO sauce, kale and fregola) was another solid offering. The clams were buttery featuring a depth of flavour which was neither too salty, sweet nor spicy. 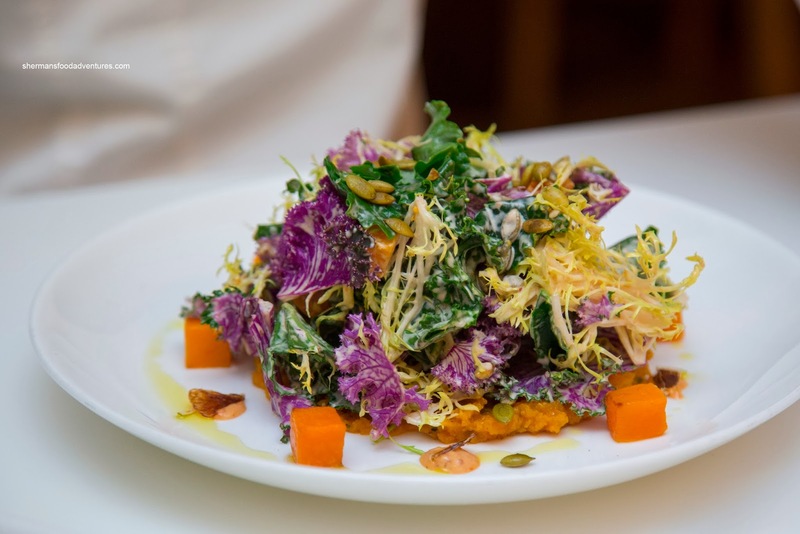 The firm fregola and crunchy kale added body to the dish. 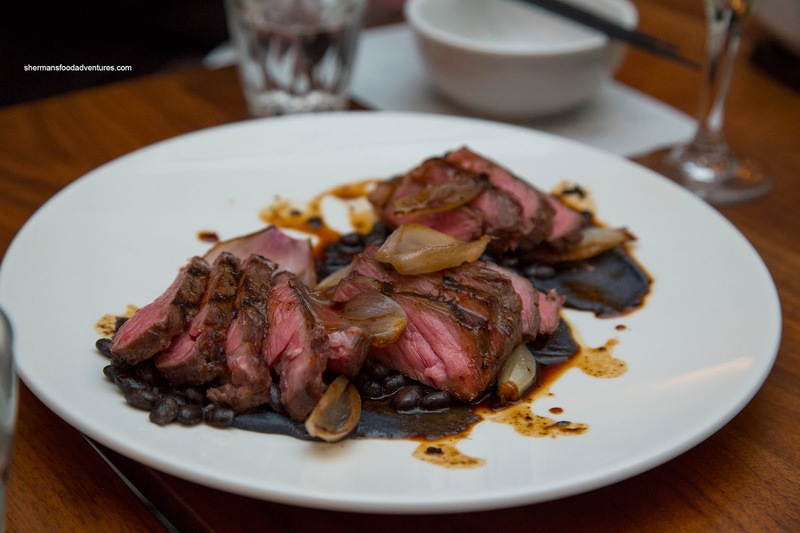 Saving the meat for last, we had the Beef Striploin with black beans and black garlic jus. The well-seasoned striploin was a beautiful medium-rare featuring an appealing sear on the outside. It was sufficiently tender with a meaty texture. I liked how the black beans retained a bite while the jus added a certain sweetness accented by vinegary finish. Surprisingly, the dessert was really good and a refreshing finish to the meal. 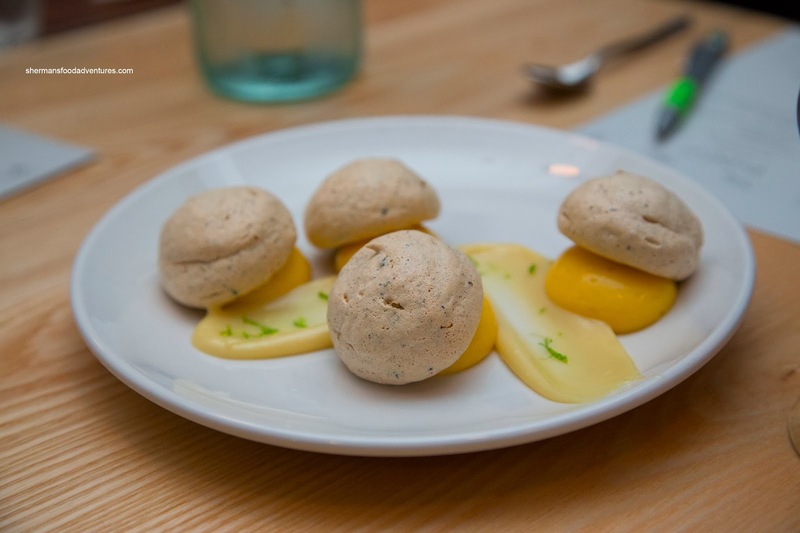 The Black Sesame Meringues were lightly crisp on the outside and soft & chewy on the inside. However, the combination of kalamansi curd and coconut and lime white chocolate created a flavour explosion of sweet and tart hits. Really good. Next stop, we headed over the Fairmont Pacific for a visit to Oru. 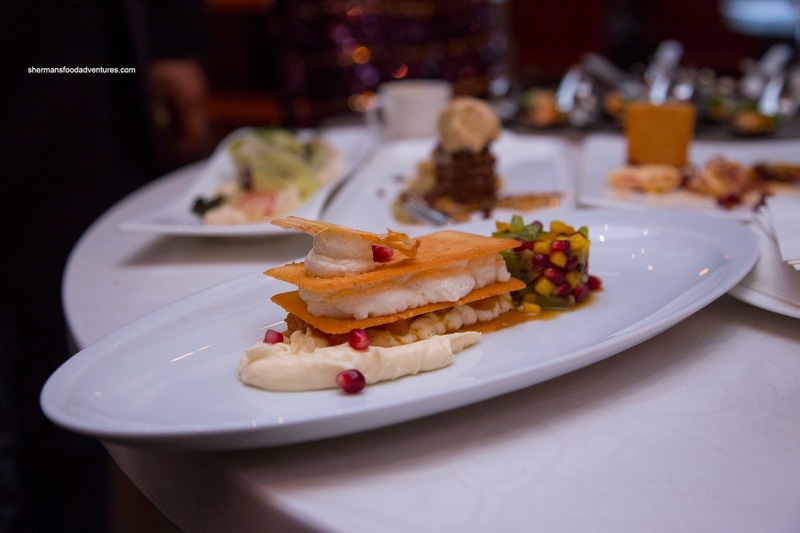 With their DOV menu, there are 3 choices for each course. We sampled everything starting with the 3 appetizers including the Roasted Sunchoke Mocha consisting of a sunchoke veloute, truffled milk foam and morel cocoa powder. 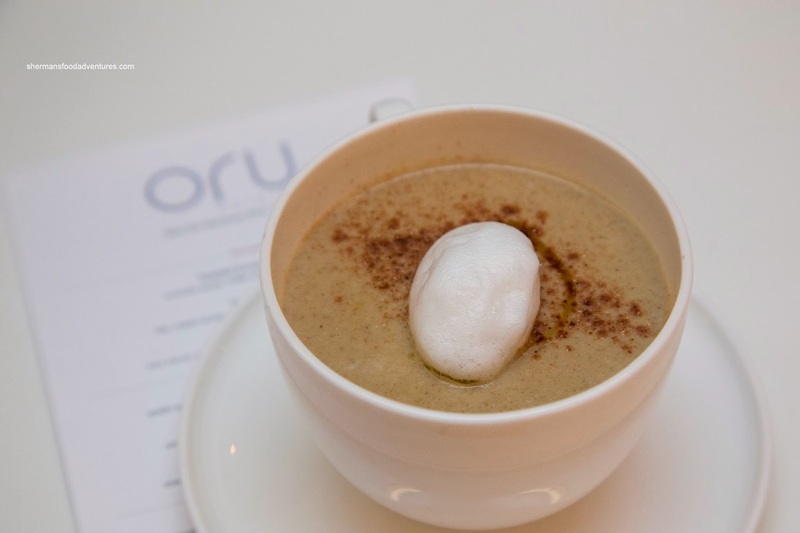 The smooth veloute was definitely Earthy with a certain sweetness and depth. I liked how they were conservative with the salt which afforded a more natural flavour. Next, I sampled the Oru Winter Salad consisting of kale, frisee, roasted squash, lime, pumpkin seeds with a chipotle Caesar dressing. There was no absence of crunch to go with the smoothness of the squash. What set this salad apart was the spicy dressing as it livened up the flavours. Lastly and my favourite was the Pork Belly dressed in a pineapple-maple and mustard glaze with lotus poi, baby bak choy and crispy sage. 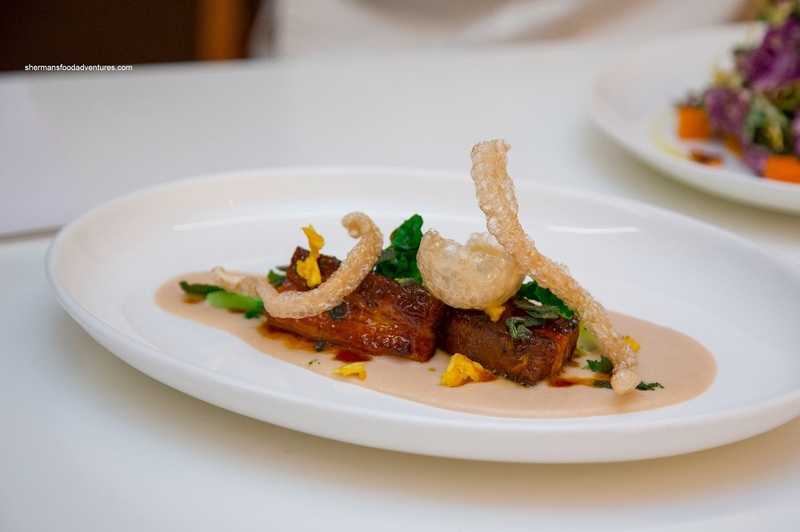 This pork belly was melt-in-my-mouth worthy where the glaze had an immediate impact with a noticeable caramelized sweetness. I particularly liked the light chicharrons on top. Moving onto the mains, I sampled the Angus Reserve Short Rib first. 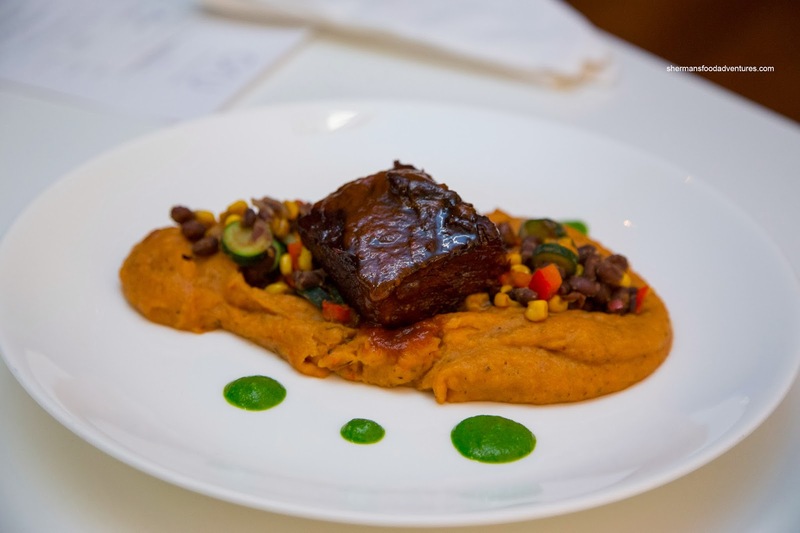 It was served with guajillo spiced mashed potato, black bean, corn and zucchini succotash and a mole sauce. Although the mole was not as complex as I would've liked, it really didn't matter as the short rib itself moist and fatty without any stringiness. The mash exhibited a smoky flavour while the succotash featured soft, yet still vibrant veggies. Being Asian, I was drawn to the Cape Breton Lobster like a moth to a flame. 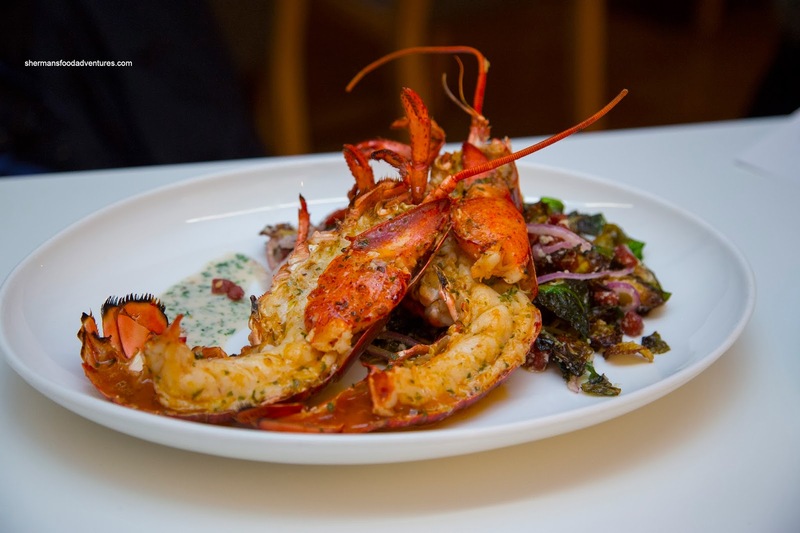 As pictured, it was a whole broiled lobster with paprika lime butter and a warm brussel sprout and chorizo salad. I found the lobster to be a touch more done than I would've liked it, but it was still good nonetheless with a natural sweetness enhance by the cooking method. The paprika lime butter was not a bystander in this case as it was very apparent. The accompanying brussel sprouts were delicious where they exhibited spicy creaminess accented by the salt of the chorizo. The Vegan Sweet Potato Shepherd's Pie rounded out the middle course selections. I didn't mind it as it was bursting with flavour from the mushrooms and pearl onions, but I wasn't a huge fan of the potato (lacking dairy, the best they could do though). For dessert, I tried the Malted Peanut Butter and Beer Nut Bar first. 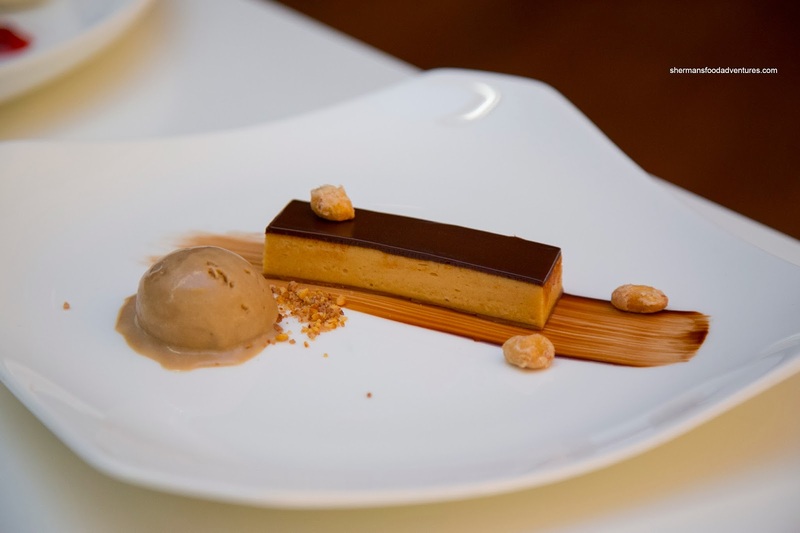 It consisted of chocolate ganache, peanut butter mousse, salted caramel nuts and malted ice cream. This was not a subtle dessert by any means as the salty and sweet peanut butter hit me in the face with one bite. It was soft and creamy where the nuts added a nice crunch. 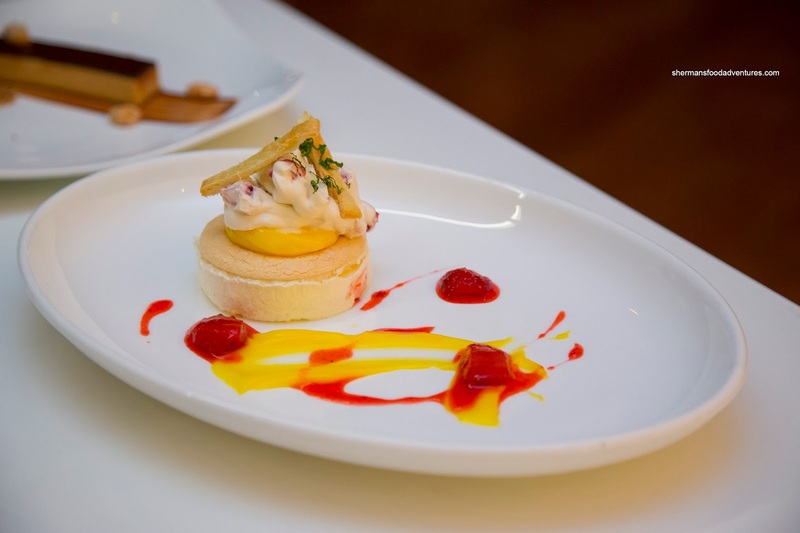 The lightest option of the bunch was the Strawberry Shortcake Mille Feuille with strawberry compote, sweet puff pastry, diplomat cream and lemon curd. With pillowy soft meeting a light crispiness, there were nice textures at work. Light and creamy with only a touch of sweetness contrasted by tartness, this was my favourite dessert. 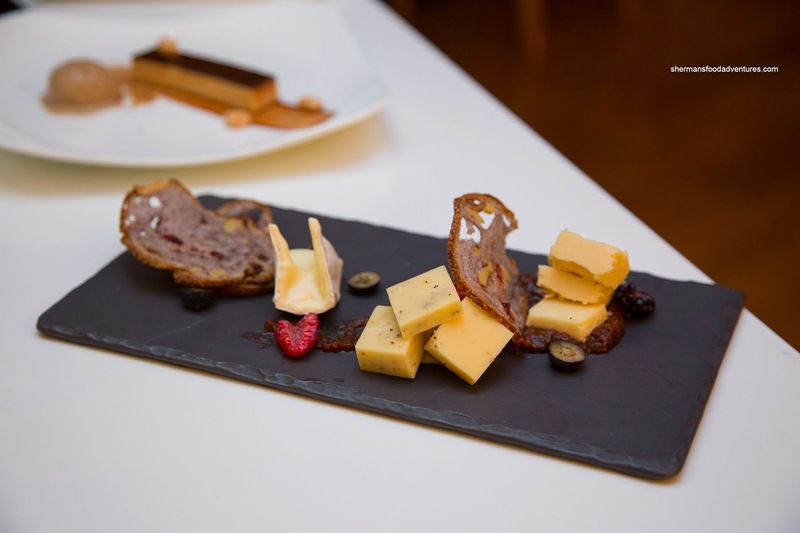 Lastly, there was an option of Local Cheese consisting of Natural Pastures aged farmhouse cheddar, black pepper ver de lait and Golden Ears Cheeseworks brie with quince mostarda and crisps. Although stuffed to the max, we made our way to West for our last tasting of the night. 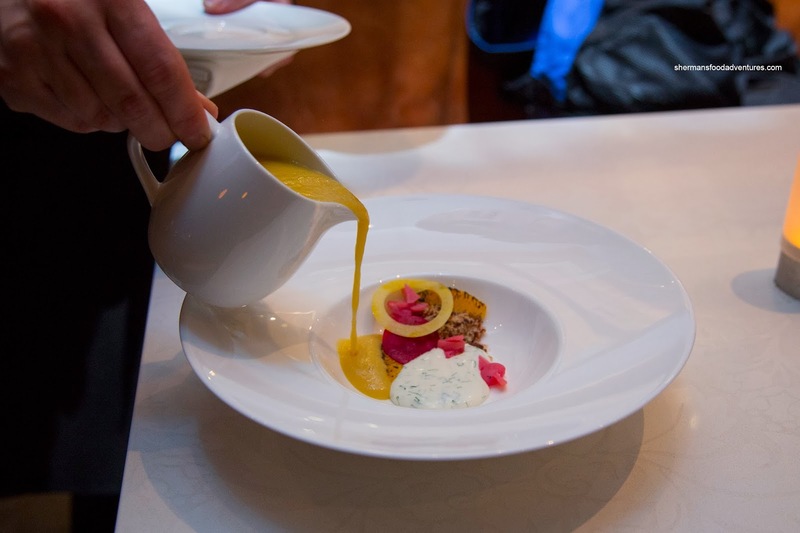 We kept remarking to each other that these were #firstworldproblems - too full from good food... Anyways, we got to sample their 3 appetizer options for their dine out menu including the Golden Beet and Orange Soup with bacon panko and tarragon creme fraiche. Despite the thickness of the soup, it was fairly light and refreshing with the appetizing zip of citrus. There was a certain Earthiness there as well as the saltiness from the bacon. I found the Baby Carrot and Watercress Salad (with Agassiz hazelnuts and preserved stone fruit vinaigrette) to be equally refreshing. 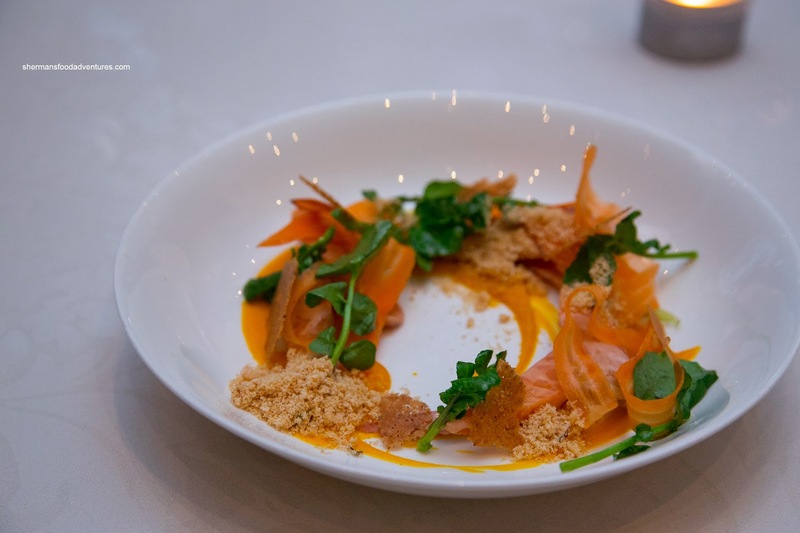 With a nice level of acidity and the crunch from the carrots, there was both texture and flavour. Next, I tried the Leek Ash Crusted Albacore Tuna with shaved fennel and radish dressed with a sake miso emulsion. 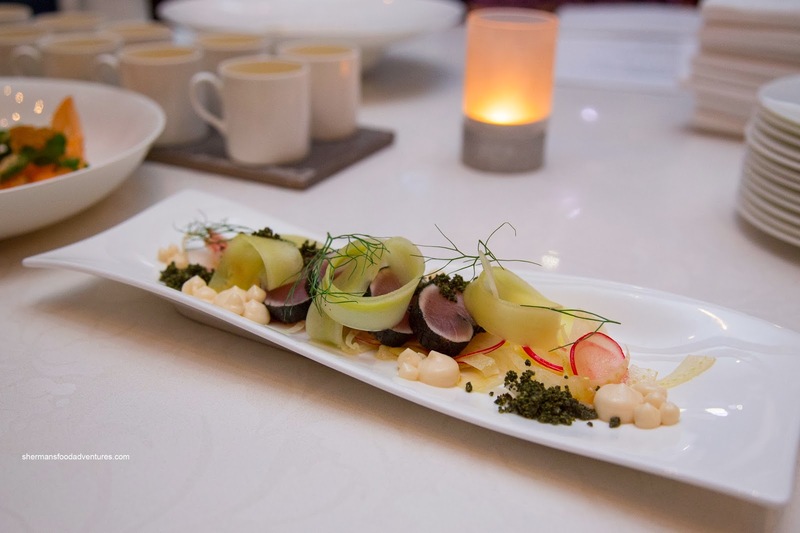 This was a rather subtle dish as the delicate tuna was not overwhelmed by any of the other ingredients including the smoky leek ash. I would've liked to seem more of the emulsion for some saltiness though. 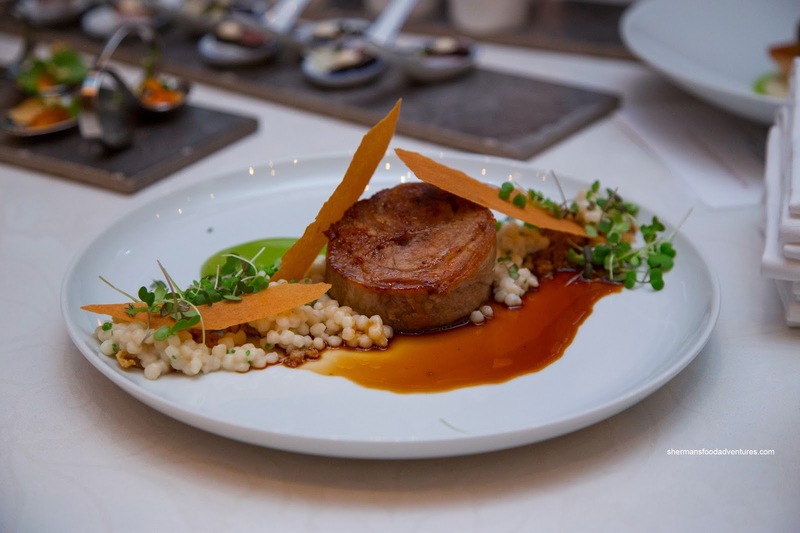 The choice of mains included a wonderful Slow Cooked Veal Breast (with roasted cauliflower, pearl couscous and thyme jus). Despite looking like a dense chunk of meat, the veal was fork tender and did not require much effort to chew. It had a rich natural meat flavour accented by the mild jus. The Pacific Provider Wild Pink Salmon was decent albeit slightly dry from the pan sear. I guess it is a catch-22 with pink salmon as it can dry out easily while the crispy sear on the outside was essential. 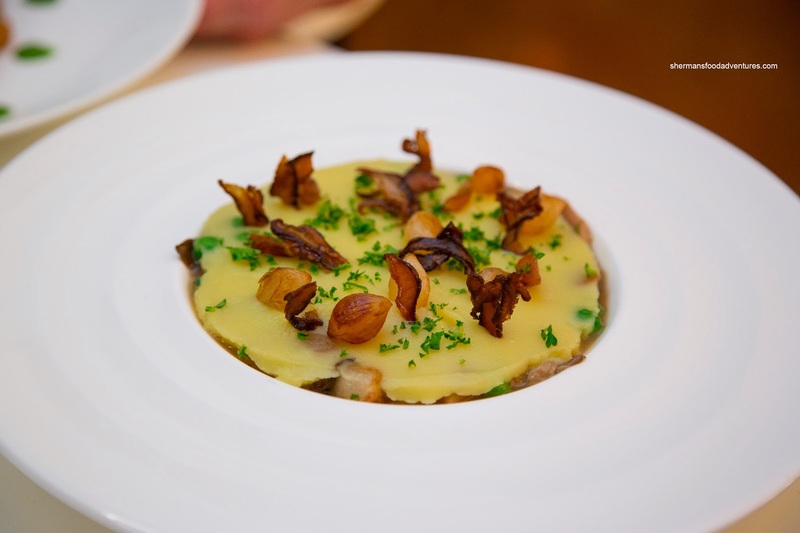 It was accompanied by a Yukon gold potato blini, sunchoke puree, black truffle and parsley marmalade. Combined with all these ingredients there was a mix of Earthiness and sweet hits. 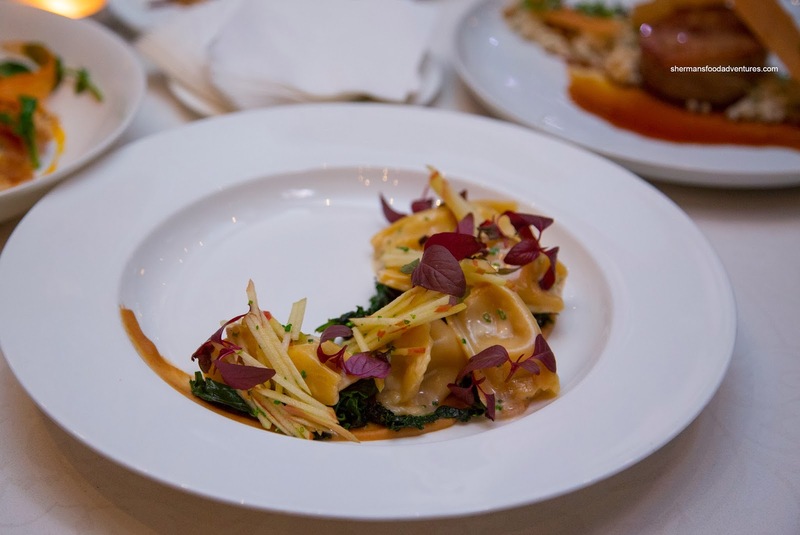 The vegetarian option was the Handmade Caramelized Parsnip Agnolotti with braised kale and brown butter apple vinaigrette. I found the pasta to be very al dente (which I personally prefer). Due to the mildness of the ingredients, it wasn't exactly exploding with flavour. However, the brown butter vinaigrette added a nice background richness while the apple sticks on top added some crunch. The best item we had all night was the Roasted Pineapple on coconut wafers with cream cheese mousse accompanied by a tropical fruit salad. Despite my indifference with desserts, I really liked this one as it was light, creamy, crunchy and naturally sweet from the caramelized pineapples. 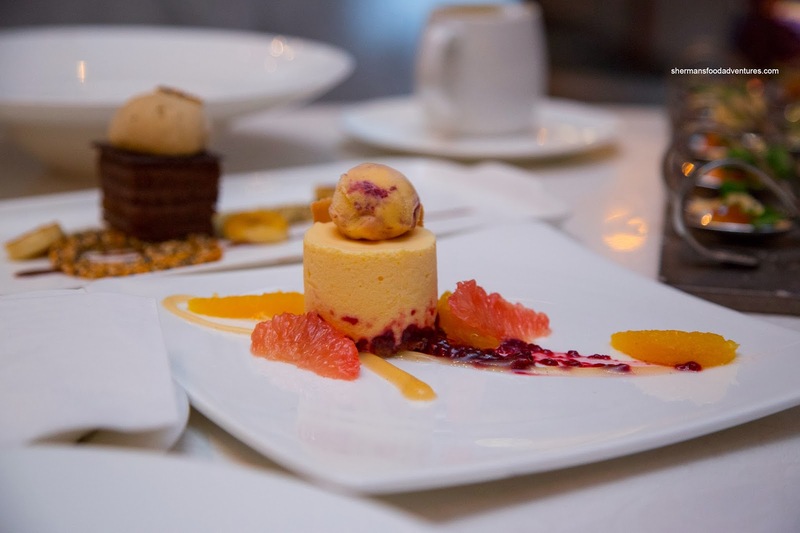 Moreover, the Citrus Tart was equally refreshing with a spiced whole wheat crust and vanilla raspberry swirl ice cream. I found the texture of the tart to be a cross between a pannacotta and a mouse. It had some zip and mild sweetness. 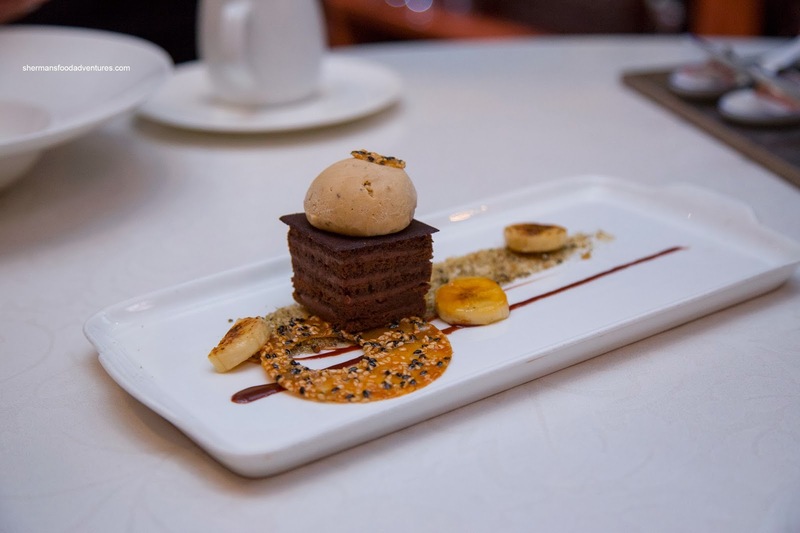 Lastly, the Malted Chocolate Cake benefited from crispy layers which added a nice crunch to the soft semi-sweet cake. It was accented by caramelized banana and sesame snaps. Impressive... That is the one word that could accurately describe the items we tried on this DOV preview. As much as I am not a fan of DOV personally, I can say this much - for the restaurants I tried, they really have seemed to up the ante for DOV 2014. You really can't lose with these $38.00 menus. I'm so glad you posted this!! I'm going to ORU w/ my sister when she visits this month and the food looks awesome!!! I'm excited!! @Wendy Yes, Oru has a really good menu for $38.00. Whole lobster! Albeit it small, but a whole lobster nonetheless.